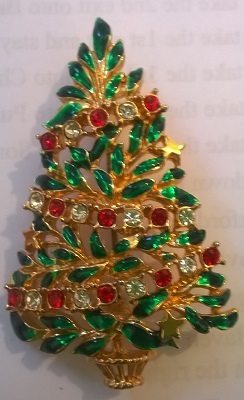 Christmas Tree brooches came into vogue around the 1950s although some very fine examples were manufactured prior to this. 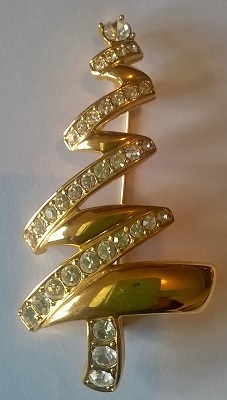 Many of the well known names in the jewellery world have produced these brooches such as Weiss, Hagler, Carnegie, Hollycraft and Coro to name but a few. Today there are many fine quality trees being produced as one off pieces that are likely to become the collectables of the future. 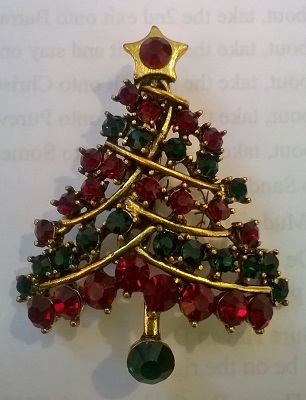 For more information on collecting Christmas Tree brooches click here for a list of books. 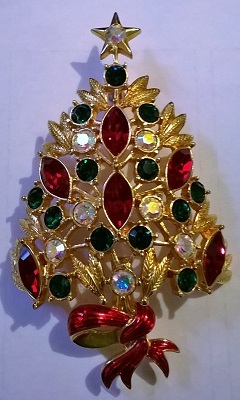 Stunning large Christms Tree brooch in the style of Attwood & Sawyer. 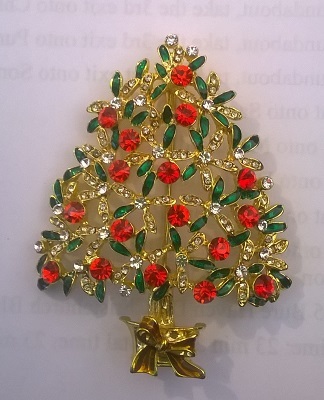 The tree is done on gold tone and is smothered in red, green and auoroa borealis diamante stones on a filigree leaf background. It is finished off with a red enamel bow at the bottom and a clear diamante star. This is a similar style to one done by Attwood & Sawyer but is not signed. Beautiful design and traditional colours, this one is a real show stopper and definitely one to keep. Size is approximately 7.25cms tall by 4.5cms wide. 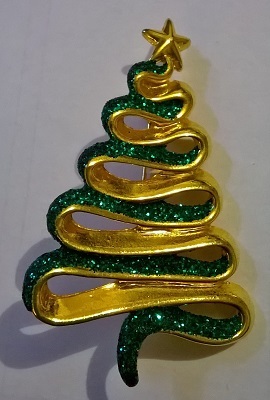 Simple but stylish Christmas tree pin. 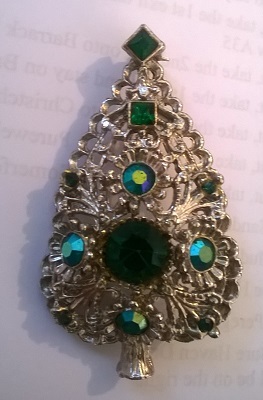 Done on gold tone it is decorated with large green facet cut diamante stones which have tooling in between. Sits in a frilly top gold tone ‘po’t. Really pretty and lovely traditional xmas colours. Size 7cms tall by 4.5cms at it’s widest. 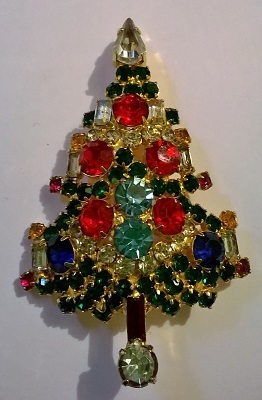 Beautiful signed WEISS slanty layered Christmas tree with multi colooured facet cut diamante stones all down the swags. It is done on goldtone and has some filigree work between the stones. A classic Weiss design, that can be found in all the Christmas tree books, it would look great on that little black dress. Signed. Size 6cms tall by 4.5cms wide. 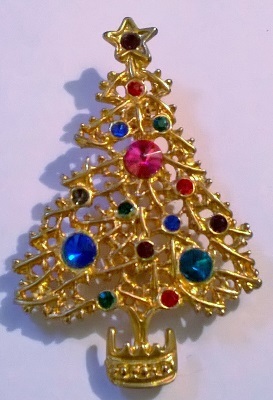 Pretty little Christmas tree brooch done on gold tone filigree. It has three large diamante stones and more little ones in among the filigree. It has a purple diamante ‘star’ and sits in an unusual shaped pot that looks a bit like a crown. Unusual colours and jsut right for a lapel. Size 5.8cms tall by 3.5cms wide. 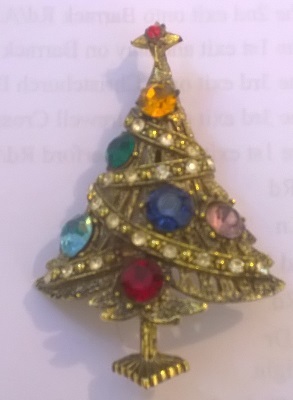 Cute little Christmas Tree brooch. Done on gold tone it is covered in green metallic enamel with multi coloured diamante balls and sits in a frilly ‘pot’. Great size for a lapel and lovely traditional design. Size approximately 5cms tall by 3cms wide. 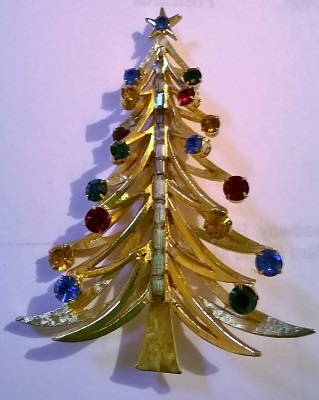 Great gold tone Christmas tree brooch by LIA. 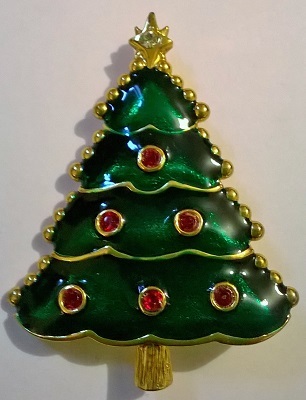 It is done in metallic green enamel with a swag effect picked out in gold tone and six lovely red diamante ‘baubles’. It has a clear diamante star. Lovely traditional colours and a good size for a coat. Signed. Measures approximately 5.5cms by 4cms at it’s widest. 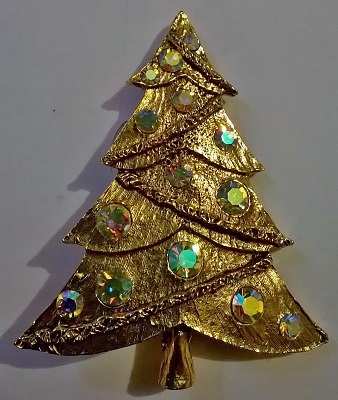 Pretty textured Christmas tree brooch on gold tone. Textured to look like fir boughs it is covered in multi coloured diamante ‘baubles’. Lovely traditional design. Size approximately 6cms tall by 4cms at its widest. 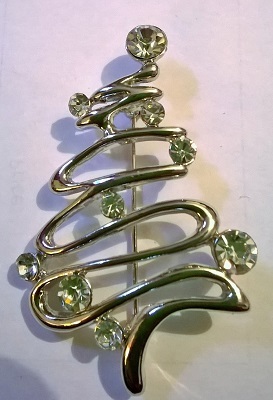 Simple yet stylish ribbon design Christmas tree brooch done in silver tone. Beautiful swirly chrome or silver tone ribbon embellished with different sized clear diamante stones as ‘baubles’. Really pretty design which would look great on any outfit or colour. Measures approximately 5.5cms by 3.5cms at its widest. 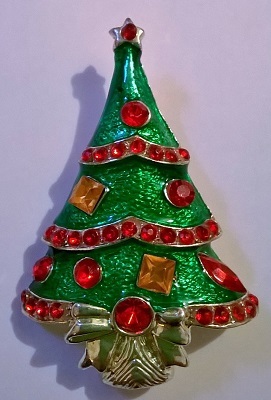 Lovely traditional colours on this Christmas Tree brooch which is done on silver tone. It is done all in filigree with loads of green and red diamante stones and a pile of tooled presents underneath – teddy, drum and wrapped present. Size approximately 6cms tall by 4cms at its widest. 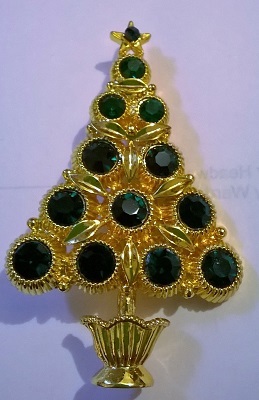 Really pretty diamante filigree design Christmas Tree brooch. Done in silver tone it has dark red diamante stones in layers on the filigree design. Simple yet easily wearable it is just right for a jacket lapel. Size 5cms tall by 2.5cms wide. 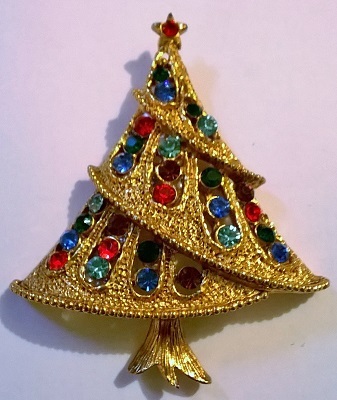 Stunning enamelled Christmas Tree brooch done on gold tone in a design used by both Christopher Radko and Kirks Folly although this one is not signed. The design is a Partridge in a Pear tree it is done in sparkly enamel which makes it look almost iridescent. Very pretty, with it’s gold tone partridge, and sure to get the comments. It measures approximately 7cms tall by 5cms at its widest. 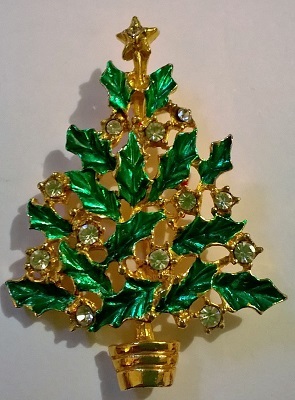 Great sparkly holly design Christms Tree brooch. Done on on silver tone it has metallic green holly leaves all over with green diamante ‘berries’ and is finished off with a green enamel pot. Size is approximately 7cms tall by 5cms wide. 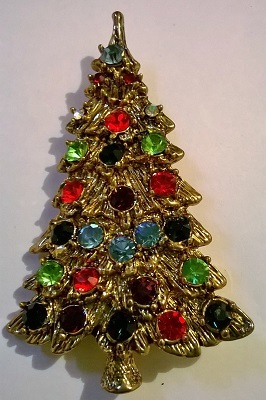 Great sparkly 3D design Christms Tree brooch. Done on gold tone it has metallic green fir boughs all over which come out to the front as well gining the brooch a 3D effect. It is covered in tiny red and clear diamante balls. Just right for a lapel. 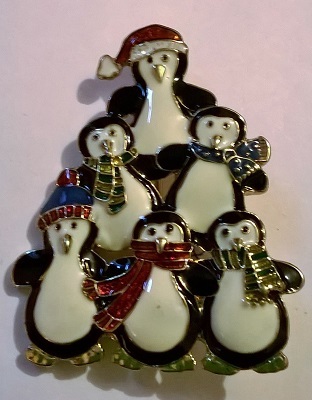 Size is approximately 5cms tall by 3.5cms wide..
Whimsical Christmas tree brooch designed as a pile of penguins. Enamelled all over and done on silver tone the penguins are all done out in their Christmas finery. Calling all penguin lovers. Size approximately 4.5cms tall by 3.5cms at its widest. 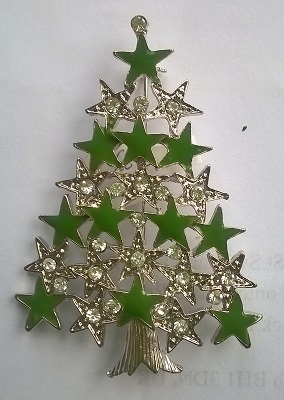 Unusual clover or shamrock star Christmas tree brooch done on gold tone. Smothered all over in a filigree design of emerald green diamante stones whit two little clear stones in the middle as contrast it has a clover or shamrock star on the top and a deep pin on the back. Definitiely an Irish commection to this one. Size approximately 5.5cms tall by 4cms wide. 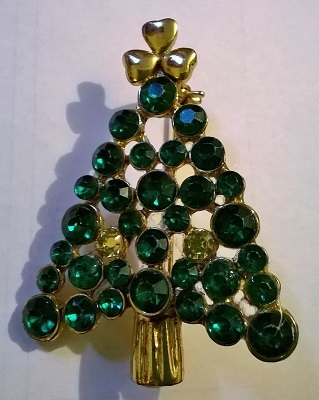 Fabulous vintage Christmas tree brooch by HOLLYCRAFT. Done on a tooled gold tone background it has large facet cut multi coloured diamante stones with smaller clear stones forming swags in between. Wonderful traditional colours and lovely design. Signed. Size approximately 6cms tall by 4cms at its widest. 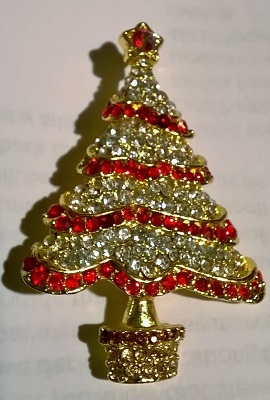 Pretty little Christmas tree brooch smothered in red diamante stones. It is done on gold tone and also has some gold painted ornaments in among the diamante balls. Great on a jacket. Size approximately 5cms tall by 3cms at its widest. 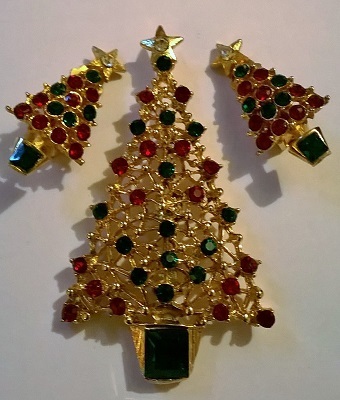 Great Vintage Christmas tree brooch and matching clip earrings. Done on gold tone in a filigree design it is smothered in red and green diamante stones and finished off with a square green diamante baguette pot. Really unusual and would go nicely on any outfit. Size of the brooch approximately 7cms tall by 4cms at its widest, and the earrigns are 2.5cms by 1.5cms. Sweet little Christmas tree brooch done on silver tone. The filigree branches are covered in red, green and clear diamante ‘balls’, the pot is decorated with clear diamante stones and there are a couple of the stones which dangle when worn adding a bit of flexible interest. Great size for a lapel and very pretty. Size approximately 5cms tall by 3.5cms at its widest. 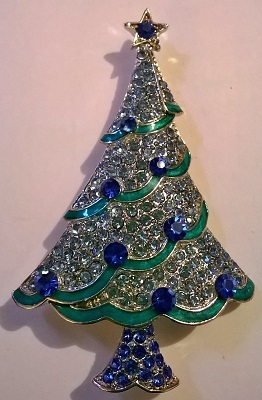 Gorgeous blue diamante Christmas tree brooch done on silver tone. The body is smothered in pale blue diamante stones, the trunk has darker blue stones and the swags which are dark green enamel are highlighted with larger dark blue diamante stones. Really pretty and traditional design. Size 5.5cms tall by 3.5cms wide. 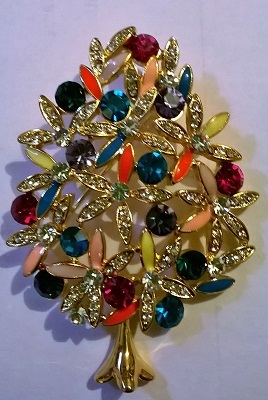 Fabulous Christmas Tree broochby WEISS. Lovely textured gold tone background in a swag design and covered with lovely facet cut aurora borealis stones as ‘baubles’ which really catch the light and reflect the surrounding colours of whatever you are wearing. Very wearable and sure to stand out in the crowd. Signed. Size 6cms tall by 5cms wide. 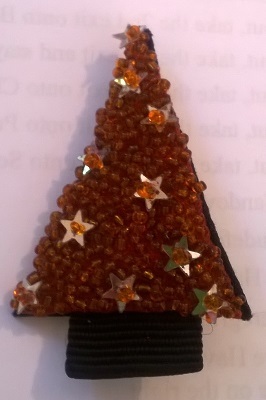 Unusual Christmas tree brooch done on ribbon. Smothered in amber coloured beads it has star shaped, what look like sequins, to depict the ‘baubles’. The trunk is textured ribbon. Not seen one like this before. Great size for a lapel. Size 5.7cms tall by 3.5cms wide. 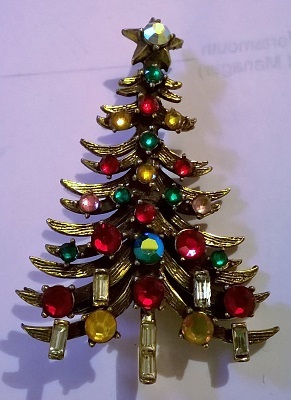 Unusual slightly 3D vintage Christmas tree brooch by BROOKS. Done on gold tone in a filigree design it has multi coloured diamante balls with a trunk picked out in rectangular clear diamante stones. Signed. Size approximately 6.3cms tall by 4.6cms at its widest. 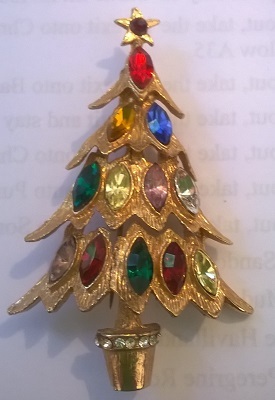 Unusual enamelled Christmas Tree brooch done on gold tone in a design that is commonly used by WEISS although this one is not signed. 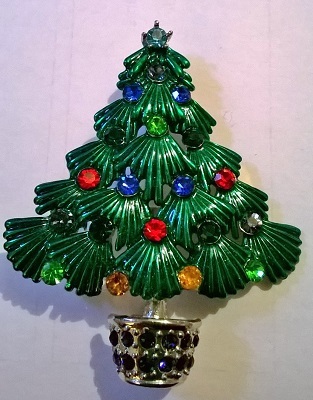 It is covered in a pretty green metallic enamel and has lots of multi coloured diamante balls all over it with a really pretty frilled edge at the bottom. Very pretty and great for someone that wants something that little bit different. Size approximately 6cms tall by 4.5cms at its widest. WOW! 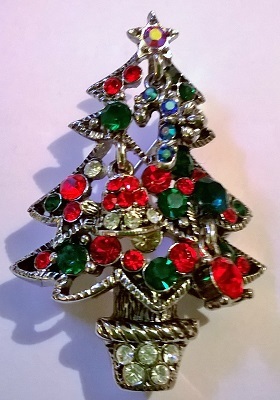 Lovely snow tipped vintage Christmas Tree brooch by ART. 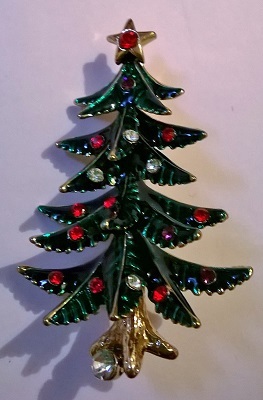 Done on gold tone it has a metallic green enamel background with snowy white tips to the branches and little multi coloured diamante ‘baubles’. It is topped off with a red metallic enamel star and has an ambery brown metallic trunk. Great traditional design and colours. Signed. Size approximately 5.25cms tall by 4cms wide. 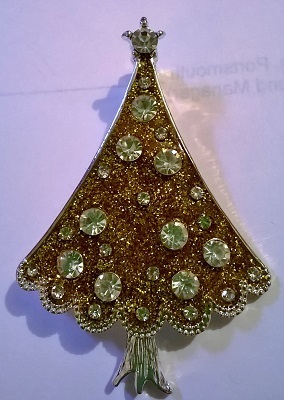 Very sparkley diamante Christmas tree brooch done on gold tone. 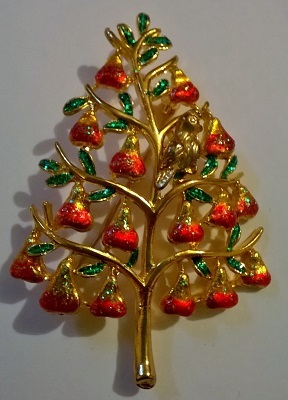 It is made to look like and apple tree with red diamante apples and green metallic leaves, all interspersed with clear diamante stones and finished off with a bronze enamel and gold tone bow at the foot. This one looks stunning on and is sure to get the compliments. Size approximately 6cms tall by 4.8cms at its widest. 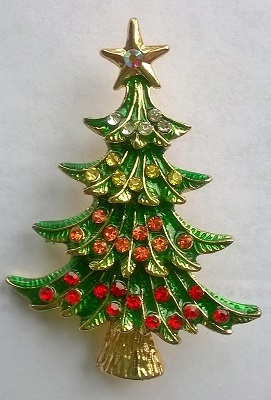 Lovely enamel and diamante star Christmas tree brooch. Done on silver tone it is a designed as a pile of stars some clear diamante and some dark green enamel, with a tooled trunk. Simply yet striking it would go with any colour. Size approximately 6.5 tall by 4.5cms at its widest. 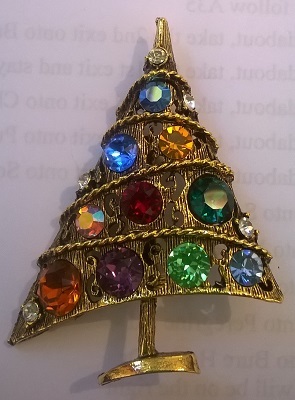 Gorgeous Christmas tree brooch done all in pretty multi coloured diamante stones. 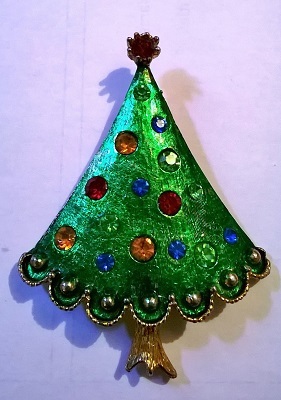 Swags of fir ‘bough’, done in green enamel, are interspersed with vibrant multi coloured diamante stones. All dark green diamante stones are used to decorate the pot. Really pretty and traditional design and colours. Size 6.3cms tall by 5.4cms wide. 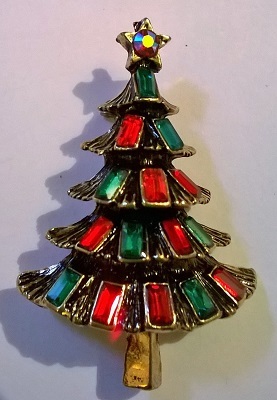 Unusual dangle design Christmas Tree brooch by AVON AMERICA. 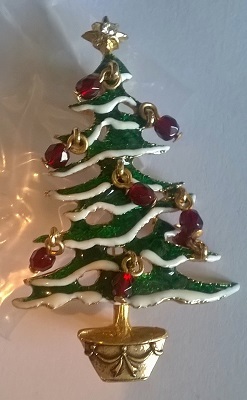 Done on gold tone it has green enamel swags edged with white enamel snow and red glass bead ‘baubles’ which dangle when worn (I couldn’e get them to lie flat for the photo but they all swing down nicely). It has a clear diamante star and a tooled pot. 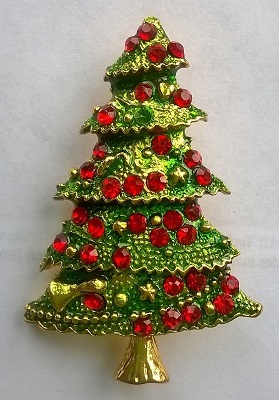 Avon America do a different Christmas tree pin every year and this is one of the earlier ones. Lovely traditional colours and design and very festive. Signed. Size 6cms tall by 3.8cms wide. WOW! 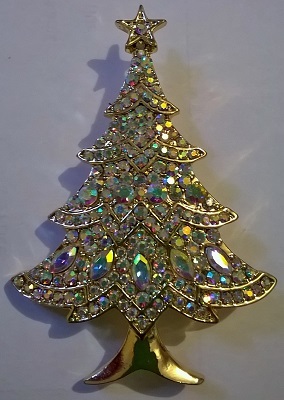 Fantastic vintage diamante Christmas tree brooch by WARNER. Done on gold tone it is simply smothered in different shades and sizes of diamante stones with a red diamante trunk and pear shaped baguette ‘star’. A real classic and in all of the Christmas tree books. A ‘got to have’ for any collection. Signed. Size approximately 6cms tall by 4cms at its widest. 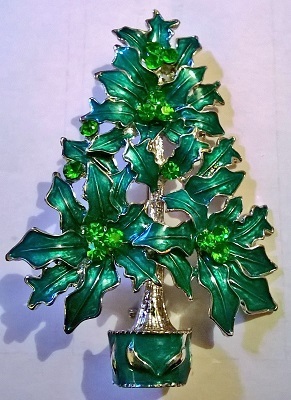 Fabulous vintage filigree Christmas tree broochby HOLLYWOOD. Done on silver tone it has a lovely central dark jade facet cut stone which is surrounded by smaller jade aurora borealis stones. Would go with any outfit or colour and add that bit of bling for the season. Signed. Measures approximately 6.2cms tall by 3.5cms at its widest. 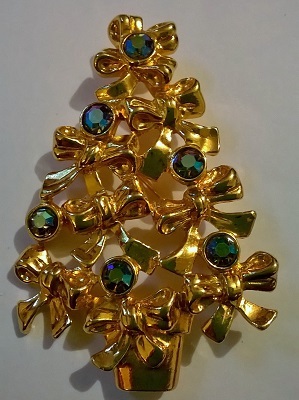 A striking ribbon design Christmas tree brooch done on gold tone. Fabulous filigree ribbon done in alternating green glitter enamel andshiney gold tone. Lovely gold tone star finishes it off at the top. Unusual design which would look great on any outfit. Measures approximately 6cms by 3.5cms at its widest. Pretty little Christmas Tree brooch done on silver tone. I believe that this design was originally done by Franklin Mint but this one is not signed. Covered in green metallic enamel it has swags of red diamante and red and amber diamante balls. It is finished off at the bottom with a pretty bow. Great size for a lapel being approximately 5cms tall by 3cms wide. 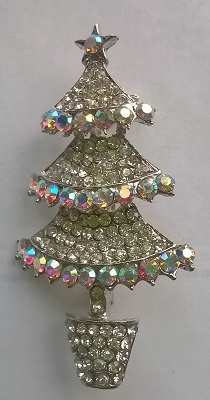 Lots of bling on this three layered diamante Christmas tree brooch. Done on silver tone each layer is smothered in clear diamante stones and edged with really pretty aurora borealis stones. It is finished off with an aurora borealis star and a clear diamante pot. Catches the light beautifully. Very wearable and a good size for a lapel. 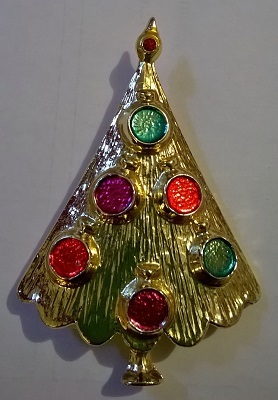 Size approximately 6cms tall by 3.5cms at its widest..
Beautiful design Christmas tree brooch done on gold tone. The swag design is made up of layers of textured gold tone with oval facet cut multi coloured baguettes to depict the ‘baubles’. It is finsihed off by a gold tone pot edged with clear diamante stones. Traditional design and very wearable. Measures approximately 6.3cms tall by 4cms at its widest. 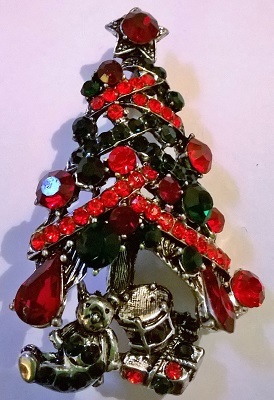 Pretty little layered and swagged Christmas tree brooch. Done on gold tone it has layers of green and red rectangular baguette stones with a red shaded aurora borealis ‘star’. Very wearable and a good size for a lapel. 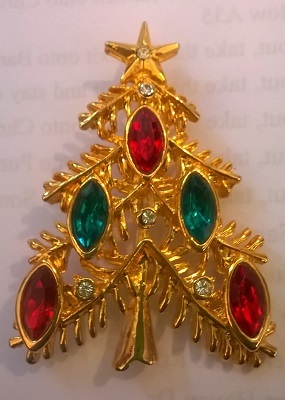 Size approximately 4.25cms tall by 3cms at its widest..
Beautiful design Christmas tree brooch done on gold tone. The swag design is made up of strings of clear and red diamante stones with a filigree design of green enamelled leaves in between. There are also some gold tone stars randomly placed among the filigree and it is finished off with a gold tone filigree pot. Traditional colours and very wearable. Measures approximately 5.5cms tall by 3.5cms at its widest. 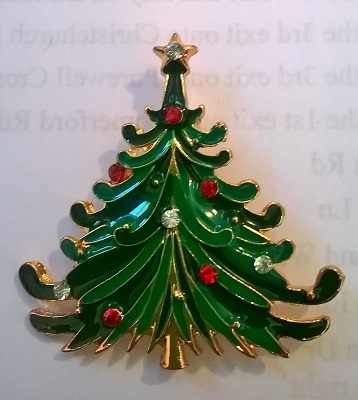 Pretty enamelled Christmas tree brooch done on gold tone. It is enamelled in green and each swag has a different coloured lot of diamante balls which shade down from the top. Very attractive and wearable in a traditional design. Size approximately 5.2cms tall by 4cms at its widest. Attractive tooled Christmas tree brooch done on gold tone. The swags are like boughs of fir and there are five large green and red facet cut baguettes as ‘baubles’ with some smaller clear diamante stones scattered in between. Simple design but very wearable in a traditional colours. Size approximately 5.8cms tall by 4cms at its widest. 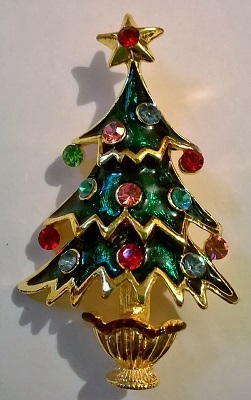 Cute little Christmas tree brooch done on gold tone. 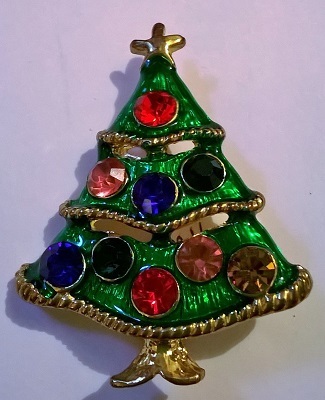 The green enamel swag design is decorated with very pretty multi coloured diamante stones and the swags are edged with a tooled band of gold tone. Lovely traditional design and good size for a lapel. Measures approximately 4.5cms tall by 3.5cms at its widest. 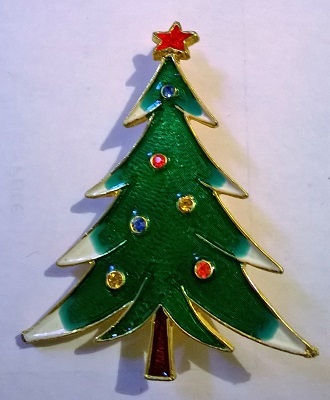 Pretty enamelled Christmas tree brooch done on gold tone. The green enamel swags have a layered 3D look to them and are decorated with red and clear diamante ‘balls’. It has a clear diamante star. Traditional design and colours. Size approximately 4.5cms tall by 4.5cms at its widest. 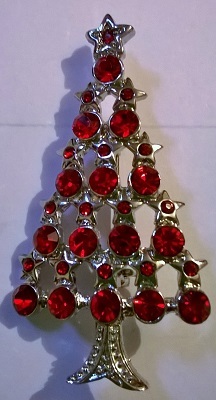 Last but not least a lovely JJ (Jonette Jewellery) filigree christmas tree. Filigree ovals filled with multi coloured diamante stones and a tooled swag design all done on gold tone. Lovely red diamante stone star. Simple yet effective design which would look great on any outfit. 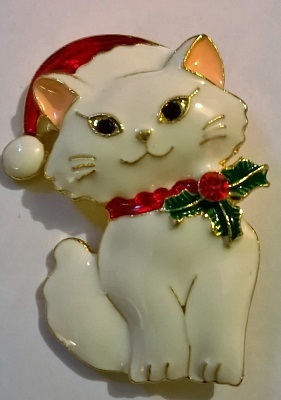 Measures approximately 5.5cms by 5cms at its widest. .
Just had to include this cute little Christmas Cat brooch. Looking for a good home and so well behaved. Size is approximately 4.5cms tall by 3.5cms at it’s widest. Not strictly a Chrismas tree brooch but so cute that I had to have them. 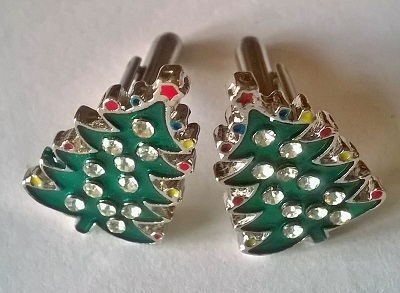 A lovley pair of enamelled Christmas tree cuff links with clear diamante stones and different coloured enamels down the side to depict the ‘baubles’. For the man (or woman) who has everything!!. Size of the trees approximately 2.3cms tall by 1.5cms at their widest..